Nasir al-Din Haidar is seen seated at a table with a British officer on his left and an English lady on his right; the King's hand rests on the Englishman's hand. The table is spread with glasses and dishes. There is a group of Indian ministers standing on the left and two dancing-girls and two musicians standing on the right. In the background is an elaborately stuccoed doorway with chandeliers and glass shades; in the foreground a fountain and flower beds. The British officer is most likely Lord Bentinck, Governor-General and Commander-in-Chief (1828-35). He and his wife visited Nasir al-Din in April 1831. However, Bentinck was an old man in 1831, and this man is painted as much younger. 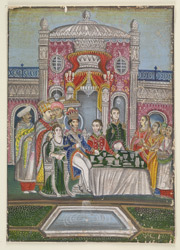 Modaunt Ricketts, Resident in Lucknow (1822-30) is most likely the gentleman standing behind the table.